‘I had planned on running the GSR with a friend but they were injured so plans for the run changed. Wayne kindly drove me down and we enjoyed the sunshine on the walk to the start area but didn’t see any other SJs in any of the cafes we looked in. Well organised start area with plenty of urinals making things less stressful for us males (and also the ladies one hopes). Dropped our bags of and went our separate ways to the start waves. The number of people in each wave is huge and with only one pacer it was difficult to tell where to position myself in the holding area. 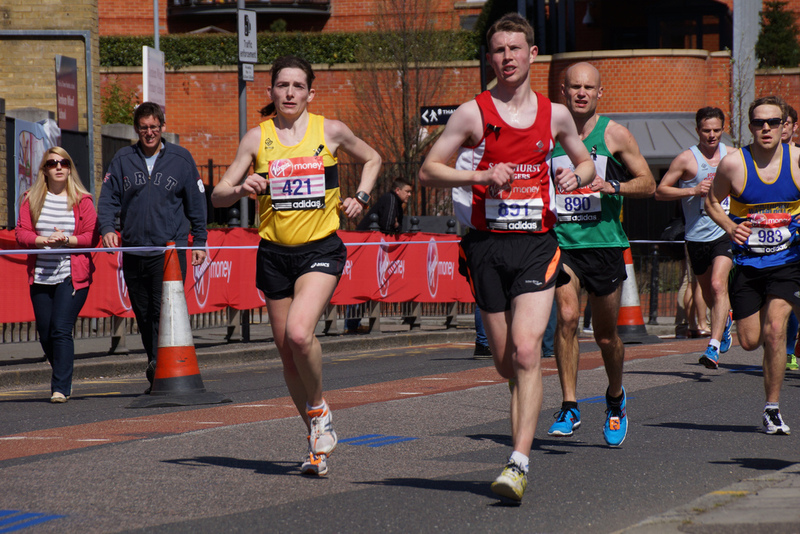 Ten milers are a tough distance if you are used to longer runs – is it a short half or a long 10K? I take them as a long 10k which means pretty much flat out from the gun and hang on for the next hour and a bit. The weather warmed up during the event and hydration became an issue. The bottles (do events really still provide bottles?) at the water stops had very narrow necks which made drinking difficult without stopping and eventually I had to walk a few paces to get a proper amount inside. ‘Last year, I ran my first GSR and in fact, my first 10 mile race. I was so impressed with the big event buzz, that I signed up for the 2018 event, 1 day after the 2017 run. ‘I was expecting a busy but flat 10m route ,correct on both counts. Went with a target of 66 mins which was on par with the first 10 at Bournemouth half two weeks ago. Disappointed that the large start pens weren’t split up on to better time zones , just a mass start which meant a far bit of weaving inside the first mile to try and get some clear running space. Lot of headphones in use and I actually caught the heel of one lady who came straight across me on one turn .